Sarah Ann was one of ten children born in 1815 to Daniel Barrell and Ann (nee Johnson). Before this marriage, Daniel had been married to Susannah (nee Cole) for four years. They had one child, a daughter, also named Susannah who was born in 1813, four years after her parents had been married. Sadly, Daniel’s wife died two months after the birth of their daughter. In less than a year after Susannah’s death, Daniel remarried, this time to Sarah Ann’s mother, Ann. With a young baby to care for it’s not surprising that Daniel remarried so soon after his first wife’s death. At a time when there was little support available to a widower with a young child, there wasn’t the luxury of a long period to grieve. Daniel had to provide for himself and his child. There is little information available about Sarah Ann’s half-sister, Susannah. However it is known that she married John Warter at St Mary’s Church in 1834. One of the witnesses to the marriage was Sarah Ann Barrell. One can surmise from this that the relationship between these half-sisters was close one. Sarah Ann’s other siblings were Emma b 1817, Eliza b. 1820, Rebecca b. 1822, Daniel b. 1825, Mary b. 1827, Caroline b. 1829, John b. 1832, Agnes b. 1833 and Esther b. 1835. Over a twenty year period Ann had ten children, that is approximately a child every two years. To put this into perspective, when Sarah Ann was 14, she would have had younger siblings aged 12, 9, 7, 4, 2, and her mother would have been pregnant with her seventh child. There would have been an expectation that the older children would not only help in the care of the younger ones but Sarah Ann and her sister, 12 year old Eliza, would quite possibly have to be earning to help with the family income. Even then I can imagine that with 9 people to feed and clothe there would have been some degree of poverty. This situation must also have been incredibly draining on Sarah Ann’s mother to have been pregnant so often and trying to care for her family at the same time. Not only was there this unrelenting hardship but for many families there was the heartbreak of losing a child in infancy, as happened in this family when John was born in 1832, and who died at the age of seven months. There was also the devastation of losing Rebecca when she was 18 years old. In 1841, at the age of 25, Sarah Ann married Ephraim Eaton, a carpenter. In 1841 they had their first child Eliza. She was followed by Sarah Ann in 1845, Harriet in 1847, Elizabeth in 1849 and Caroline in 1854. The first four children being born with the same two year gaps as her mother had borne her children. According to the census, the family lived most of their lives at The Cross, Wivenhoe, until the children left home. The 1861 and 71 census describes Sarah Ann as a schoolmistress. Exactly how much formal training she had for this role is hard to know as there was no registration requirement for teachers until 1870. As early as 1814 education was available for a small number of children in Wivenhoe. A Sunday and day school was established in one room of a small cottage. In 1848 a schoolhouse was opened in the High Street where 250 children were enrolled. The school by then was receiving regular government grants intended for maintenance and the construction of schools. In 1874 this enabled the High Street school to enlarge its premises to hold 380 children. In 1891 a new building was erected in Philip Road to cater for infants and girls. The schools together could then accommodate 667 pupils. However the average attendance at the schools was only 330. Earlier in the 19th century, there was also a nonconformist school behind the Congregational Chapel which catered for 20 children. By 1833 it had 130 boys attending. It was maintained by subscription and donations. The boys attending the school paid 1 penny a week. In 1847 John Sanford paid for the building of a new school which could accommodate 250 children. However the school closed in 1853 and reopened in the chapel vestry in 1856. It continued until 1866, but by 1870 there was no record of the school. During the mid 1800s there were a number of small private schools. In 1871 seven private venture school were recorded. It is possible that Sarah Ann could have been a schoolmistress in any of these schools, or in the larger government-funded school. Between 1861 and 1871, Sarah Ann’s 5 children were moving away from home, either to marry or to work. Eliza Ann was the eldest of Sarah Ann’s children. In 1864 at the age of 20, she married John Henry Eley who was a blacksmith living at The Cross in Wivenhoe. Although they married in St Mary the Virgin Church, they do not show up on the census as living in Wivenhoe after that date. It can only be assumed that they moved out of the area. Sarah Ann, who was the second of Ephraim and Sarah Ann’s children, married John T H Dawson a railway signalman. They moved to Saxmundham soon after the marriage and went on to have four children and continued to live in Saxmundham. In 1881, when Sarah Ann was living in the almshouse, they were shown on the census to still be living there. Elizabeth married John Baker, a carpenter. They had four children and lived in Wivenhoe. They were still in Wivenhoe during the period Sarah Ann was living in the almshouse. Harriet married John Hawkins who was described in the 1871 census as an Iron Stone Miner and in 1881 as a general labourer. They had two children, Thomas and Edwin born 1870 and 1877 respectively. Harriet died in 1887, three years before her mothers death. Neither Thomas or Edwin are shown on the 1891 census living with their father who remarried in 1890 to Elizabeth Taylor, a widow with 3 young children. Thomas is found in the 1901 census living in Staveley, Derbyshire. He is living with his mother-in-law Margaret Griffiths. His status is widower. Thomas had married Annie Elvira Griffiths in the first quarter of 1900. By the December of that year Annie was dead. In 1911 Thomas has returned to live with his father and stepmother. He is shown to be in partnership with his father as a house painter. Thomas is then aged 40. It is not known if he remarried. Thomas’s brother, Edwin, following his mother’s death, is next found on the census at the age of 14 in Yorkshire in the home of his uncle Charles Hawkins. It’s not clear if Edwin is visiting or living with his uncle, but what is clear is that when he died in 1898 at the age of 21, Edwin was still in Yorkshire. Caroline the youngest daughter, in 1871, was living in Colchester and worked as a servant. 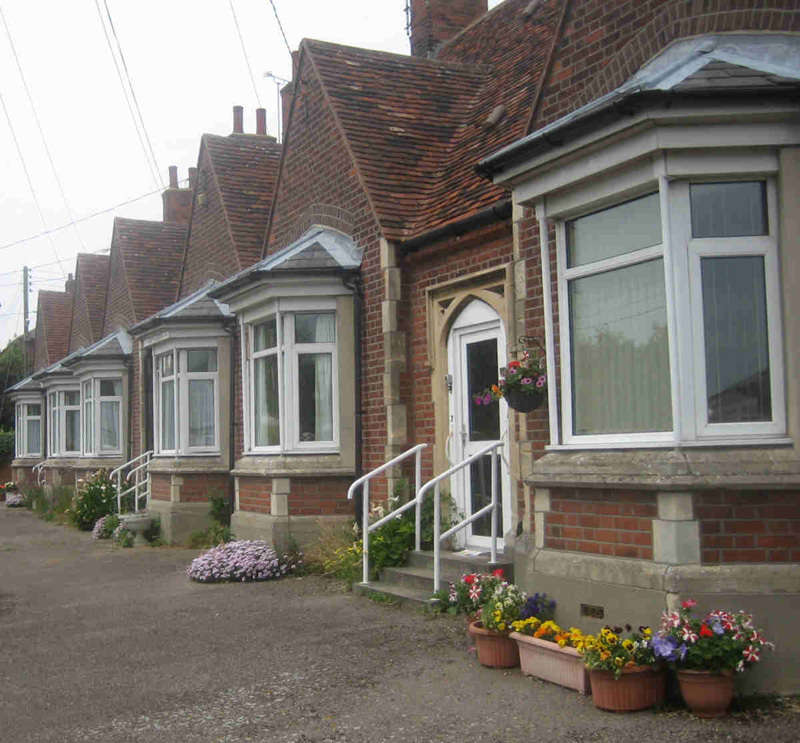 We can deduce that Sarah Ann was one of the first residents of Mary Ann’s Almshouses which were built in 1873. It would appear that of her five children, only her daughter Elizabeth continued to live in Wivenhoe, and therefore probably was the only one to have regular contact with her mother. Sarah Ann continued to live in her almshouse until her death in 1890. This page was added on 24/12/2016.